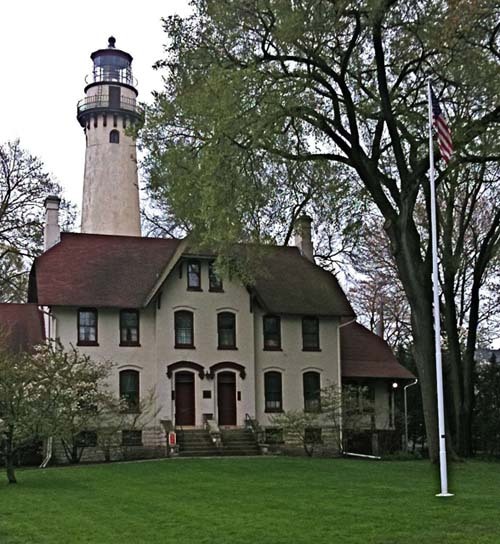 The historic 113-foot-tall Grosse Point Lighthouse, built in 1873 after a number of shipwrecks, is located at the intersection of Central Street and Sheridan Road, marking the easternmost edge of the Central Street Neighborhood. The tower is an iconic symbol of Evanston whose image graces the city seal. The tower and former lighthouse keepers' residence, shown here as seen from the sidewalk abutting Sheridan Road, are open for tours in the summer.